Chris and I were looking for a casual place to stay for our anniversary, and came across Tops'l Farm in Waldoboro, Maine. Sarah, the owner, and her family live in the farmhouse on the property, and have created a wonderful atmosphere for their guests. The campsites are the most adorable A-frame structures. Although we did not stay in them, they come highly recommended by others I talked to. We booked the sole cottage they have on the property for our stay. The cottage itself at Tops'l is one of the coziest interiors we have stayed at in all of Maine thus far. It is located in between Wiscasset and Rockland, and about an hour and fifteen minutes (depending on traffic) outside of Portland, Maine. It's also about a 5 minute drive to the infamous Moody's Diner who have a decent cup of coffee. Fresh flowers greeted us as soon as the door opened. It's amazing how little touches like that make a room instantly come to life. Sarah, the owner, happened to be outside when we arrived and stopped to say hello before we unloaded our car. The cottage is situated right next to their big barn, which overlooked an open field. I loved seeing bees working the flowers in the distance as there was a hive they care for on the other side of the barn. When we opened the door to the cottage, we were immediately greeted with fresh flowers that were placed on the coffee table. It's amazing how little touches like that make a room instantly come to life. The warmth of the sunlight coming through the bare windows was very inviting. As I walked through the premises, I really admired the farmhouse vibes in the bedrooms. I don't like a cluttered area to sleep in, and this was perfect. Cozy atmosphere, but not stifled with unnecessary stuff. It was a really hot night, and while the cottage is not air-conditioned, it was equipped with fans in the bedrooms, which I greatly appreciated. The antique books laying throughout were a pleasant sight as I sat here breathing in the fresh air coming off the enclosed porch. Each nook of the house had been given careful thought, and I felt each item was there with intent. 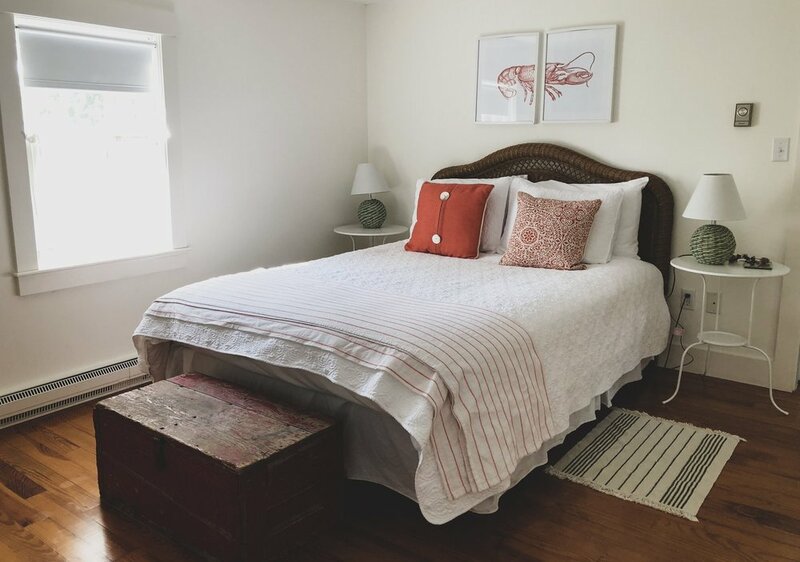 Each item was consciously placed to provide the coziest coastal farmhouse atmosphere. The kitchen was set up with everything you needed to make a nice dinner, and even had coffee waiting to be brewed. There was also a few random items that people always end up forgetting but wanting such as birthday candles. The regional cookbooks on site were a nice touch to the kitchen. ...and can we just talk about this Bill Murray-like poster? Perfect. I found myself leafing through the regional cookbooks while making dinner. In the evenings we lit the candles at the dining table and chatted over food we picked up at a local farm stand. I fell in love with the house plant that kept us company. The cottage has all your drinking vessels covered. My favorite being the vintage shot glasses. At the end of the day, we found ourselves on the perfect enclosed porch with drink in hand, reveling in the sounds of peepers and catching glimpses of lightning bugs. The next day, once the morning light started to come in through the window panes, we did not want to leave. I felt our time was too short in on this peaceful property, but we promised ourselves to visit again soon.